Over five decades after becoming one of the world’s most famous rugby players, the Harkness Fellow who played for Harvard Business School’s rugby team in 1967- 69 was still sought after by the media. 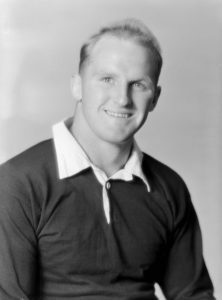 Wilson Whineray remains the longest serving captain of the All Blacks and is still regarded by many as the greatest New Zealand rugby captain of all time. He played his first international in 1957, became captain the next year at the age of 23, and went on to play 77 matches for the All Blacks between 1957-65. Playing in an era when it was solely an amateur sport, Wilson took a pause from the game in 1964 to ensure he completed a degree. Two years later he was on his way to Harvard. He arrived at a tumultuous time with the Vietnam War and protest demonstrations at full pitch, the declaration from Lyndon Johnson that he would not run for another term, the assassinations of both Bobby Kennedy and Martin Luther King and a victory for Richard Nixon in the November 1968 election. Like many other fellows he would not have got to the US without the Harkness Fellowship. His parents had five children and were far from affluent: “Money was put aside each week to pay for essentials, like the gas bill…. Mum only had one coat.” Nor was there much money made playing international rugby in the amateur days. He had chosen the US because he was keen to work for a global company. Ironically, having gained his MBA at Harvard he turned down offers from General Motors and Ford and opted to return to New Zealand. There he began working with a company which grew to one of the country’s biggest, Carter Holt Harvey, currently employing 10,500 in the timber trade and pulp, paper and packaging. He rose to become chairman, retiring from the board in 2003. His other successful business positions included being managing director of NZ Wool Marketing Corporation (1973-74), Chairman of the National Bank of New Zealand, and director of the Auckland International Airport. O’Reilly played for Ireland, but they had played together for the Barbarians, an invitation team for top internationals several times. It was against the Barbarians in Cardiff in 1964 that in the course of the traditional last game of what was an all conquering All Black tour, Whineray swerved and dummied his way for one of the team’s eight tries. In a memorable scene at the game’s end, Whineray was carried off the field shoulder high, not just by the All Blacks but by Barbarian and Welsh supporters too, to the echoes of a large part of the Welsh crowd singing “For he’s a jolly good fellow”. Those were the days. Among his many honours and awards Wilson was a guest on the BBC’s Desert Island Discs on 8 February 1964; New Zealand Sportsman of the year 1965; knighted in June 1998; inducted into the NZ Business Hall of Fame 2002; and was one of the first five players to be inducted in the newly inaugurated International Rugby Board’s Hall of Fame in October 2007. In November 2004 the New Zealand Herald reported him to be the top contender to replace Dame Silvia Cartwright as the Governor General of New Zealand, but he refused to let his name go forward. Post Publication Note. Wilson died in October 2012, aged 77.